Joint health supplements are quite popular right now, with the advent of clinical research on various ingredients that prove their efficiency in reducing inflammation, pain in the joints and repairing the cartilage that loses its natural flexibility as people age. Picking the right one, however, can feel like a real challenge, which is why we are here, to help you decide which one is the best. 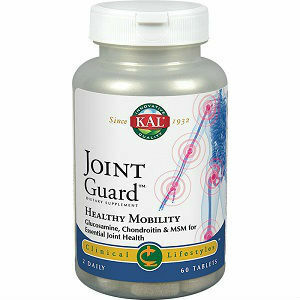 Kal Joint Guard is a formula mainly based on glucosamine, the ingredient unanimously recognized as being the most efficient in treating aching joints. However, the action of glucosamine needs to be combined with other compounds, like vitamins, minerals and herbal extracts. This seems to be exactly what Kal Joint Guard is doing, so let’s see together what this formula is all about. What Does Kal Joint Guard Contain? As you can see, there are many herbal extracts included in this formula, with the main ingredient remaining glucosamine. Be aware that the glucosamine is obtained from shellfish, so you may want to talk to your doctor in case you are allergic. We notice the use of some very good herbal remedies like boswellia serrata and turmeric, but we do not see major components like chondroitin and MSM, known to augment the positive effects of glucosamine. The recommended dosage is two pills daily, taken with a meal. A bottle with 60 pills, or 30 servings, is priced at 19.39USD. We saw no clear guarantee being offered on the website, but since the product is sold through third parties, this may be an issue to be solved with resellers. Kal Joint Guard sounds like a good, reliable product. It contains important vitamins, mineral and herbal extracts used for improving the health of your joins, especially if you are experiencing pains. It contains the much praised glucosamine, so that it can readily address any issue you may have with pains and inflammation. However, we would have liked to see more key compounds, like MSM and chondroitin included with the formula. On the positive side, the product is decently priced. Mark Stevens	reviewed Kal Joint Guard	on October 23rd	 and gave it a rating of 2.